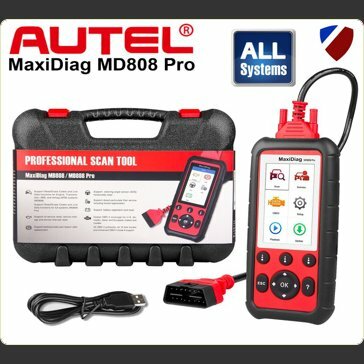 The Autel MaxiDiag MD808 Pro is our direct replacement for the MD802 and is built to take your diagnostic experience to a whole new level. Loaded with functions & ability to diagnose & reset engine, abs, airbags, transmission, A/C, power steering, parking sensors, suspension, oil service reset, DPF regeneration & reset, battery registration and reset, parking brake pad relearn after replacement, steering angle sensor relearn. MD808 Pro can access ALL available modules for the best diagnosis operations. With all that enclosed in a 4-inch hand-held device, there is no better multi functional scan tool on the market.